Senator Barbara Mikulski of Maryland, the longest-serving woman in Congressional history, will be retiring at the end of this term. Mikulski, 78, has served in the Senate since 1987, and acted as a Representative for 10 years before that, a total of 38 years in Congress. "I'll tell you what I'm tired of hearing: That somehow or other we're too emotional when we talk. You know, when we raise an issue, we're too emotional. Well, I am emotional... It brings tears to my eyes to know how women every, single day are working so hard and are getting paid less. It makes me emotional to hear that. Then, when I hear all of these phony reasons — some are mean and some are meaningless — I do get emotional. I get angry, I get outraged, I get volcanic." 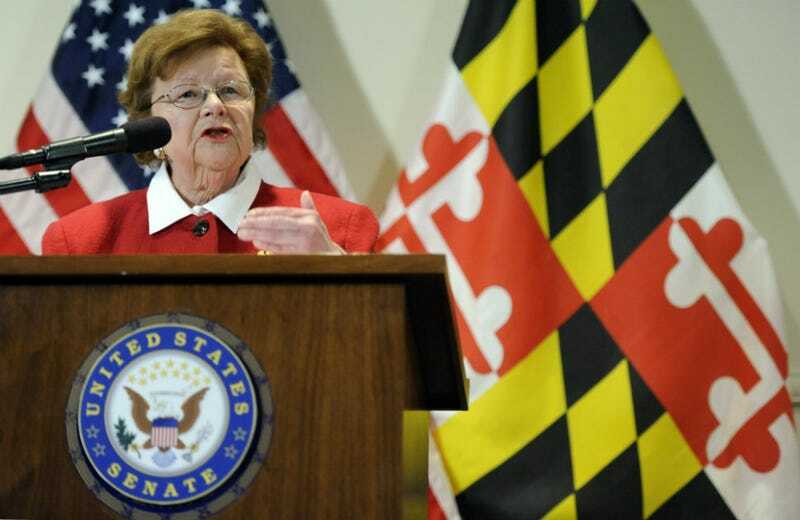 At a news conference today, Mikulski, a former social worker who the Baltimore Sun once called "a vicious terrier" about the issues she cares about, said she would rather spend the next two years "raising hell" than fundraising for reelection. "Do I spend my time raising money or do I spend my time raising hell?" she told reporters. "Remember, for the next two years, I will be here, working the way that I do."